When I first was approached in respect of a round the world golf trip, it was inevitable that a stay at the prestigious pebble beach resort would be a major highlight of the adventure. Indeed it could not be called the ultimate golf trip or livin the dream unless, the social golfer visited this golfing mecca on the Monterrey peninsula just outside Clints Carmel in sunny California. I decided after much review to play the top hundred rated Spyglass first. The second day I chose Spanish Links and my stay would be completed with a round at the daddy of them all, Pebble home later in the year of the 2010 US Open. Ironically the weather after the sun of Vancouver was pretty inclement. Wed, Spyglass day was chilly, grey, overcast but dry and still. Thurs, The Links was sunny, gorgeous with a pleasant wind. Friday, my big day, saw gale force winds, torrential storm came in when we were on the 17th. Three completely different successive days, good job the open in June, but it certainly adequately demonstrated to me what difficulty the courses would be dependent on the weather. It also enhanced my appreciation of all 3 course designers at these courses as they had to consider the differing weather patterns and particularly winds coming in off the pacific. There are a full array of pics of these 3 super courses on the facebook website of The Social Golfer. Spyglass has a most wonderful opening 5 holes that takes you downhill from the fine clubhouse to the ocean and is a super golfing test and experience after this you rise thru the forested plantations away from the sea and the course is more akin to a Carolina Course. Sadly there have been quite a loss of pine trees and oak trees which has affected the course somewhat. I am pleased to say that there is a major planting exercise which hopefully will bring the course back to its pristine set up and condition. Greens were as you would expect in great condition, a bit slow but with some deceptive slopes and gradients. I then visited the Tom Watson designed newest addition to the pebble menagerie, the splendidly titled Spanish Links and what a great experience I had. The weather was great, course despite wet was in great condition, could not of course play as designed as a true links but that did not distract at all from a fine experience, I started with a birdie 4 at the first by nailing a 40 footer and proceeded at last to find my putting touch which helped me put together a fine round. Apart from a loop from 8 to 12 all the holes are within a drive, even one of mine from the sea. So on a windy day it could be treacherous, I imagine. beach but amazingly in that small acreage is the par3 16th playing north and stunning 17th playing back south before heading back north with a torturous final par5. The wind giveth an advantage then takes it straight back, super design. An idea of the stunning beauty of this little gem taken by karens panoramic shutter, glad we found this on the digital. On Friday, the big one at pebble, we had been told a major storm had been coming in due at one, so it was going to be touch and go whether we would get round. We did get to the 17th before being drenched but the gale was with us all day. Despite this I played superbly starting par, par and no doubles despite losing a ball on the first par3 the 5th when the wind of the ocean took my ball into some ,millionaires garden. The par 5 sixth up the hill took a drive and three 3 woods into the wind and I was still short. The famed 7th just 100 yard downhill but into the teeth of the gale. i was 40 yard short with a 6 iron, but got up and down. The 8th with the wind behind was just a drive and a wedge, unbelievable experience. When the rain came on the 16th Tee, I needed a par, par bogey finish to break 80. A great drive, set up the par at 16th but the dreaded finish was left. the 17th again into a massive left to right wind needed a drive to reach the par3 narrow green. I gave it everything and just reached the front and two putts as the rain poured downleft a 6 at the famous par5 as enuff to break 80. We were in the teeth of the storm but the wind was with me and of the ocean on 18. I launched a drive over the pacific and watched expectantly that the ball would fade back into the fairway, it did over the fairway and into the bunkers at over 300 yards. Impossible. I was in deep manure, but a short escape, 3 wood of the middle wedge to ten feet and two putts for a bogey 6 and a 79. Drenched but elated on 18. Everything ever written about Pebble is true, exceptional golfing test, spectacular backdrops, it doesnt get any better. Probably the best Ive ever played. Tenth all downhill, reachable dare you try it! When we hit Vancouver, we simply couldn't believe the weather, the sun shone so bright every day and temperatures were quite mild in the late 50s. Whilst the organisers of the Olympics were concerned and cancelling events and bringing snow into Whistler. The effect on my golf trip was far from a concern it meant courses I had expected to be closed for winter were now open after the mild weather and increased my options considerably. 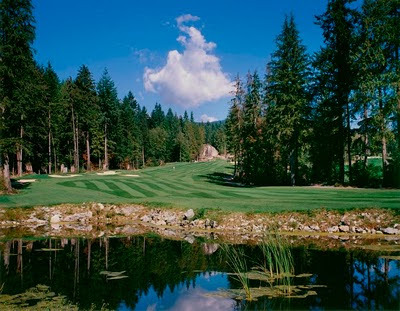 As we were staying in North Vancouver it gave me opportunity to book a round at the highly rated public course in Northlands and I was not to be disappointed. The Pros shop as well as being superbly organised what a difference from Hawaii, was well stocked and at very cheap prices for a city club. They kindly set me up with 3 great guys from the area and another great day was, I hope, had by all. Got to say there was some very fine golf played too. Canada took Gold and Bronze and I slipped in with a Silver but the Whole day was to prove a Golden One. Considering the course was coming off the back of their winter it was in quite superb condition. Greens naturally slower than any I had encountered this trip, Fairways softer, bunkers heavier, I could have been back home, but for less than $40 cd ie £ 20 this was great value for money in a splendid location. can you Adam and Eve this winter golf course. Not a cloud in the sky and no SNOW!!!!!!!!!!!!!! My last two rounds in this Garden Paradise were to look at two different types of golfing experience in Oahu, totally different in every way from Koolau. I intended to play a municipal and tried on several days to play the Ali Wai opposite our hotel. This is the busiest muni in the world and it showed from 7 am there always was a 2 hour wait and that was with 6 to a tee time. So naturally I gave it a miss. However despite the mass numbers, on walking around the course, I found the course in fine condition, very flat but without any redeeming scenic changes it was simply what it promises to be, a good cheap (less than 30 bucks ) golfing experience. Most locals walk around rather than buggy and this I am reliably told makes it a 6 hour round at times. So I looked farther afield and came across the wonderfully titled Aloha Golf who arrange golf trips for you, principally to Luana Hills and Hawaii Kai Public Courses. Lets start with the positives for a fixed fee of $125 you are collected and taken to the course, you are paired up with like minded golfers, on this occasion I played with Ed from Perth, Billy and Hugh again from Canada, a proper Commonwealth connection. And Tee Times are arranged. This side went really well but you are then dependent on the course and the organisation at Kai and later Kapolie were frankly abysmal. At both, they simply had let too many players on the course, non existent marshalling, slow play, jumpers starting at different holes combined to make a really enjoyable experience hardwork. Hawaii Kai could with the right money spent on relatively simply things, hole markers on tee boxes, adequate yardage markers, little bit of tidying up, be a very good set up, there are some exceptional holes well designed to take into account the prevailing winds of the ocean. Unfortunately after a decent first 9 my game imploded and I developed a snap hook which decimated he scorecard. Thankfully the company was great And Chief Billy Straight arrow a native Indian from Alberta who hit the ball straighter than anyone I have ever played with. Kapolie was simply beautiful, pristine, immaculate and with the great company Terry and Derwin too locals from Honolulu, should have been unforgettable. Unfortunately a delay of an hour to our scheduled tee time, a ludicrously split tee starts created chaos. The course did pull back this disappointment somewhat however. Back to the Golf, when I knew Hawaii would be on this trip, it was inevitable that Koolau would be on the agenda. rated as the most difficult course in the world at a slope rating of 152, then how could i resist. Carved out of a magnificent tropical rain forest on the side of the 2000 foot Koolau Ridge Mountain Range and features winding ravines, extreme elevation changes and breathtaking views of the mountains with cascading waterfalls. This is truly a spectacular setting which inspires from hole 1 to hole 18, Golf digest rates the final hole the hardest hole 18 on the planet. It proved to be one of the most inspiring golf experiences I have ever had. The course is owned by the local Presbyterian church which is appropriate as whilst the course designed by man its gods gift, the volcano, the forests, the ocean which truly make this memorable. The clubhouse and facilities are actually under the church, its the first time I've gone to pray before a round but most appropriate. I once more found myself with a Canadian from Alberta this time way up North called Ron and another fine guy he was too. W both played steadily, I shot 90 with 6 lost balls, no mean feat. Ron went 11 holes before the wheels came of, he found the going hard the back nine were the carts had to stay on the path and the climbs we had to endure thereafter. The 18th is truly formidable. Off the front tee you are faced with a 220 yard full carry over a ravine filled forest to a narrow fairway, this par 4 then leaves you with a further shot of over 2oo yards over another gorge filled with trees and tropical forestation to a narrow slick sloping green surrounded by bunkers. A 6 and no lost balls is a good score and thats all I got. it is said you need as many balls as your handicap here, so I beat the course. There simply is no respite, the forest begins were the fairway ends and anything a foot off line is lost. Extreme Golf at its best, but truly memorable. 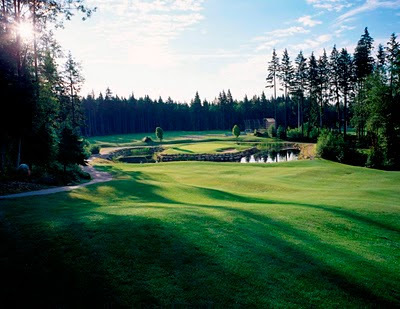 There are over 30 photos of this tremendous course on the social golfer fan site on facebook. Arrived in Hawaii, to a mixture of changeable weather, one minute scorching, next torrential rain, gales but nothing can prepare you for the simple magnificence of this idyllic paradise. For the past few days, its supa bowl sunday, the weather has settled into a sultry barmy 85 degrees of glorious sunshine and what could be better. By the way this american football some game but there a bit soft with all that padding, not a patch on the super league grand final. More about this glorious pacific outpost in the book, but I have developed a soft spot and a liking for all things Hawaiian, especially as their state flag as a Union Jack on it. Just to give a taster or feel for the place a couple of photos..... lots more on my personal facebook site. All beaches are public in Oahu so this is available to me. Swim time, me thinks.